Born in 1926 in Kawasaki, Kanagawa Prefecture, near Tokyo, Ouchi Makoto, an only child, “spent many solitary hours drawing and painting.” However, his desire to go to art school was stymied by his parents and he attended Kanagawa Prefectural Technical High School, graduating in 1945. Drawn to the discipline required of the craftsman “and his own natural inclination toward a more direct contact” with his art he took up print making. Reading the few books available in Japanese on metal plate printing and seeking the advice of other artists working with metal plates, he initially created his own acrylic plates which he inscribed with drypoint techniques. 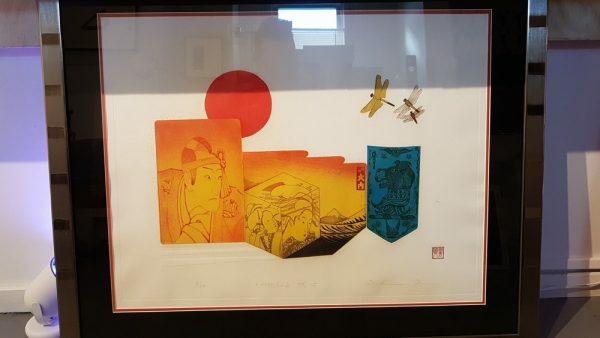 He was to go on to use both metal and paper blocks in his printing, rejecting traditional woodblock as giving images a flat-look. Drawn to the Kabuki theater since childhood he spent considerable time around actors, becoming familiar with their roles. 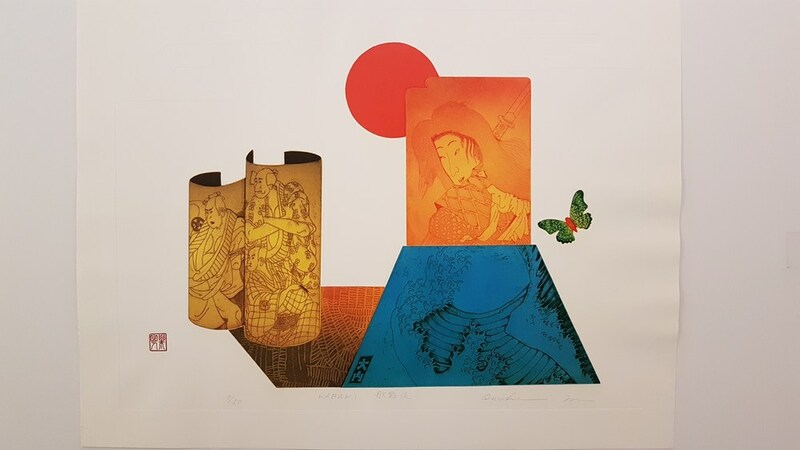 His Kabuki-themed prints such as this collection’s print “Shibaraku” (暫) reflect this familiarity. While traditional ukiyo-e themes are portrayed in Ouchi Makoto’s work, he places them within a modernist framework of cubes and cylinders giving a 3-dimensional effect.